The program includes music by 14th century composers that celebrates the Virgin Mary and the Nativity. Organized by the Direction des Affaires Culturelles. 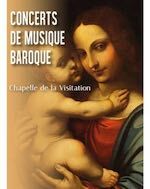 For more information phone +377 98 98 83 03 and visit the Government news feed at: Communique de presse: concerts de musique baroque.